Ventry Solutions does not yet make a battery-powered fan. We make only gas-powered and electric Ventry® Ventilation Fans which have proven safe and effective for nearly three decades. All of our fans are exceptional for positive pressure ventilation (PPV) and attack. Ventry Fans and battery fans are very different tools for very different tasks. Based on our direct experience and study, we believe battery-powered fans are insufficient for PPV when run off a battery (all battery powered fans have two air volumes specified: one if run off battery and one if plugged in). Battery powered fans do appear to be a good solution for situations requiring them to be carried indoors, for ventilating a small interior area, without introducing any CO, and for short-term use (as are electric fans). Gas fans remain the best choice for fire fighters who implement coordinated ventilation during which firefighters follow the fresh air in. Gas fans can achieve high (or low) air volume as needed. Gas PPV fans, as well as our one high-output electric fan, continue to be safe, reliable, high-performance, long-lasting solutions for our customers. They are and will continue to be best for fire departments who use aggressive horizontal or mechanical ventilation during coordinated attack (see training and research by UL Firefighter Safety Research Institute). James, our CEO, Mechanical Engineer, a firefighter, and instructor with several decades of experience, shared his thoughts on the battery-powered fans. He sees value in them (as stated above), but expressed grave concerns with the battery chemistries and how they may be affected by heat. We anticipate these concerns being resolved as the market and technology evolve, and we hope this occurs without injury to firefighters! While the unknowns work themselves out, we continue to make exceptional, out-STAND-ing, tried and true fans which work for nearly any ventilation situation. 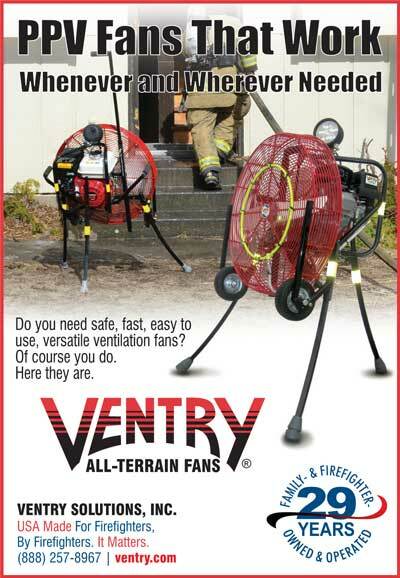 For coordinated, aggressive positive pressure ventilation and attack, Ventry PPV Fans come well recommended (read testimonials) and are quite different than all other fans.